The Unknown, Entertaining Mind of Miss Dena Jones: Corinne's Surprise Birthday Blog Hop! 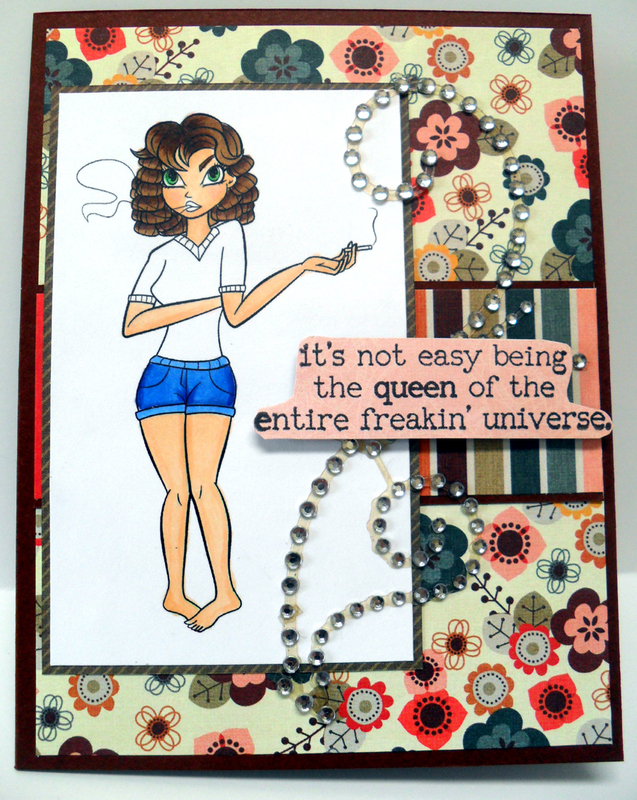 Corinne's Surprise Birthday Blog Hop! It's December 29th, and the Simply Betty gang is surprising Admin Corinne with a blog hop. Betty provided us with this awesome digi image she drew of Corinne for us to use on our projects. Corinne has been quite vocal about her dislike for LEAVES, so I searched through my paper to see if I could find anything that would fit the bill. This paper is the closest I could get. I think it's pretty! It's from the My Mind's Eye All Spice paper pad. I colored the image with Copics and then added some flourish bling. The sentiment is from a Unity set, and I thought it went perfect with this sassy image of Corinne. I hope she likes it! Now, please hop on over to Tanya's blog next to take a look at her project. Thanks for stopping by! Lovely card, Corinne will be be overwhelmed. Happy birthday to you as well, Dena. OMG, this is ANOTHER amazing card! Thank you so much and I want to wish YOU and VERY HAPPY BIRTHDAY TOO!!!! hahaha!!! love it!! Love the sentiment!! Dena your card is stunning! Thank you so much for helping me wish Corinne a happy birthday! Just to said... Be lated Happy Birthday. Wishing you a lot of good thing and a new challenges in your life. So pretty! Thanks for joining us at Charisma Cardz this challenge.